3 real-world simulations in 1 book, with computer applications projects preparing students for Microsoft Office Specialist (MOS) Certification in Word, Excel, and PowerPoint 2016. Across over 65 projects, students will practice and reinforce 100% of the MOS Certification Exam skills as they plan and create professionally-designed word processing documents, spreadsheets, and presentations. The same essential skills students develop preparing for MOS certification will also help them succeed in the workplace and beyond. In The Office Specialist.com, 2E, students get a taste of the business world as they complete work orders for three new clients: an indoor sports facility, a pet daycare service, and a café. Whether formatting a menu, creating an order form, or developing a presentation about fitness classes, students will love the engaging projects in this simulation. 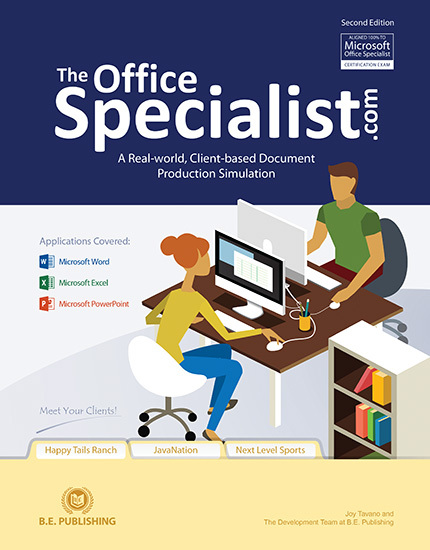 The Online Instructor and Student Resources for The Office Specialist.com, 2E are required and include source files, answer keys, and grading rubrics for all projects to help instructors administer the simulation and assess student work. A number of projects also require Student Resource Files, such as hi-resolution client logos and graphic images, which allow students to demonstrate skills such as formatting images and importing text to create professional documents and dynamic presentations. Application source files offer instructors the option to conserve class time spent keying each project's text and data, or to require students to key for additional practice. Grading Rubrics are specific to each project and facilitate assessing student's finished work and mastery of MOS Certification skills. Client logos, graphic images, and supplemental files (Word, Excel, PowerPoint, .txt, .pdf, etc.) provide students the resources they need to complete complex and realistic projects. sources for this textbook are housed on our interactive digital eLearning platform, eCTE. This document lists all the projects in which each MOS Certification skill is practiced. Since skills appear in multiple projects, correlations can be used to help students focus on specific skills, whether they are preparing for MOS Certification or simply seeking extra practice.